WASHINGTON, D.C.—House Republican Whip Steve Scalise (R-La.) joined fellow Republican leaders to express his opposition to House Democrats’ attempt to force a federal government takeover of the internet through their bill, H.R. 1644. Whip Scalise stressed that under current light-touch regulation, the internet has experienced rapid advancement and strong private investment. This government takeover would stifle innovation and allow for new taxation of the internet. 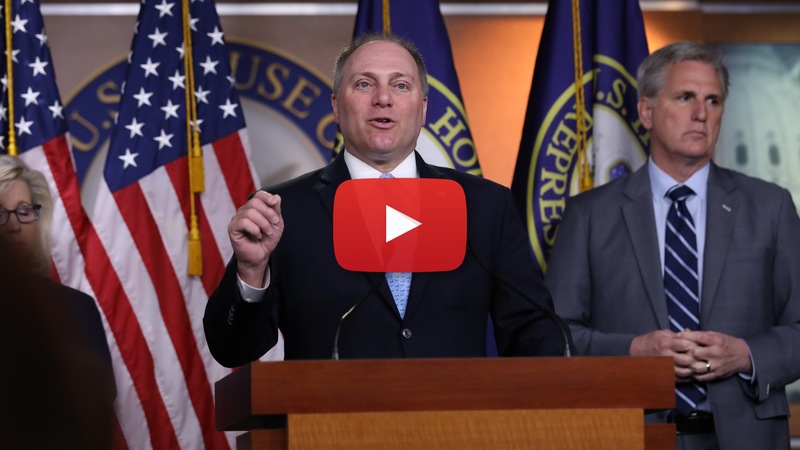 Whip Scalise then highlighted the record-setting support the Born-Alive Act discharge petition experienced last week. In the first 24 hours, more than 190 members of Congress signed on. With three Democrats already signed on, the petition only needs 18 more signatures to successfully force a vote on this bill to protect innocent newborns who survive abortions. Click here or on the image above to watch the remarks. “If you look at their bill, it is Title II regulation of the internet. Literally, taking it back to the 1930s, applying 1930s laws to one of the most innovative technological advancements that America has been the leader on. “The internet continues to expand in unbridled ways with billions of dollars of private investment coming in to allow us to do more things on our cell phone than you could do with a computer that would take up this entire room. “I’m also proud of the work that my colleagues did last week when we started to file a discharge petition. On the very first day, we set a record—for as long as the clerk’s office has kept records on discharge petitions. The very first day, we broke 190 signatures, which is a record for a first day of collecting signatures for a discharge petition on the Born Alive Act. “Speaker Pelosi, for whatever reason, wants to continue to allow that baby to be killed. This isn’t even part of the abortion debate, it transcends that debate. We’re going to continue to fight for life and fight to ensure that if a baby is born alive, it has full protections under law.